Russia’s predominantly Islamic Republic of Tatarstan, around 1,300 kilometres away from Moscow, is clearly working well to attract investment from foreign countries and businesses. The Tatar Republic has companies from Turkey, Denmark, the United States, China and Britain functioning there, and Tatarstan has topped 2015 rankings as the Russian region with the best investment climate. Many of its officials have trained abroad. 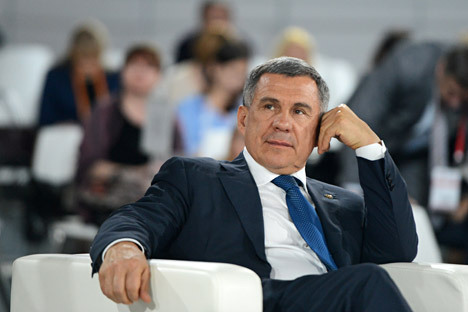 Rustam Minnikhanov, President of Tatarstan, said in an exclusive interview that developing education attracts foreign investors. RIR: What are the largest, foreign investment-funded projects being implemented at the moment in Tatarstan? Rustam Minnikhanov: We are working with investors from around the world. At the moment we are working on several major projects with Turkish investors pumping in around $1.5 billion in investment. The Danish company Rockwool has opened its biggest factory for insulating materials [in Tatarstan]. Recently, the U.S. company Armstrong, which makes ceilings, found our region attractive to invest in. Another American company, 3M, is currently completing the construction of a plant. Some Chinese companies are building a mineral fertilizer plant [in our region]. What conditions do you offer to foreign companies that convince them to invest in your region, rather than Moscow? We have two special economic zones – Alabuga and Innopolis. The Innopolis project is IT-oriented, while Alabuga is an industrial zone, where 19 production facilities are already operating. Among them is Ford Motor Company, which is expected to complete the construction of a diesel engine plant by the end of the year . The volume of gross regional product amounted in 2014 to 1.6 trillion rubles ($28.8 billion), while the investment in fixed assets totaled 542 billion rubles ($9.7 billion). There are also many industrial sites in the Republic. For instance, the industrial park Master with an area of 640 thousand square meters is located on the site of the former Kamaz factory. It is the largest industrial park in Europe. On such organized sites, we can monitor the implementation of projects so that they do not face bureaucratic difficulties. In addition, these parks have all the necessary infrastructure for investors including the engineering [capabilities], transport and qualified staff, as well as tax benefits and preferential access to energy resources and infrastructure. Tatarstan is often called the Russian Singapore. As far as we know, this is where you are sending your employees to study. Why are you interested in this particular country? Singapore offers a unique experience. This country has managed to become a world leader in many sectors in a short period since the 1960s. They have a very strong system of management training. We have created a joint company, which focuses on the training of specialists for education. In addition, we have entered into agreements with two educational centers in Singapore for the training of municipal civil servants. It is important that people see how other countries are transformed into global leaders not only in words but also in deeds. This has a positive influence on the formation of our future leaders. Does education based on international experience then help to attract foreign investors to the region? Some companies when opening a plant take their entire staff and management along with them, but you do not have to take anyone to Tatarstan. The presence of highly educated personnel is the most important competitive advantage. You can buy everything, but you cannot buy people. You stand for active cooperation with Islamic banks. Do you think Islamic capital can replace Western funding? We have always said that Russia works poorly with the Islamic world. But the Islamic world today is two billion people, of whom 20 million live in Russia. The Islamic world has great opportunities. This was confirmed by the Kazan Summit, which was recently held in Tatarstan and attended by representatives from 46 countries. Even the President of the Islamic Development Bank, Dr. Ali (full name Dr. Ahmed Mohammed Ali Al-Madani – Ed. ), came to this summit. The Islamic Development Bank is a very serious financial structure and we are looking for ways to find access to Islamic finance. As funding for Russia was restricted in the West, we will find other sources. Yes, Islamic banks are not yet clear to Russia, but today these financial instruments are used not only by Islamic countries, but the United Kingdom and other European countries. Since English law allows you to work with the principles of Islamic banking, then Russia will be able to. [We have] agreed with the head of the Islamic Development Bank to establish a special working group. On June 23-24, U.S. Ambassador to Russia John Tefft made a working visit to Tatarstan. He visited the special economic zone Alabuga and met with representatives of American companies operating in the region.